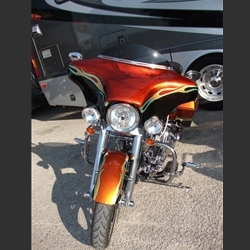 The Wide Open Harley-Davidson Road King Classic fairing fits on the factory quick disconnect windshield brackets. On Road Kings, you must have the running lights moved to the front hole. You will not need to remove the chrome wind deflector for this fairing.